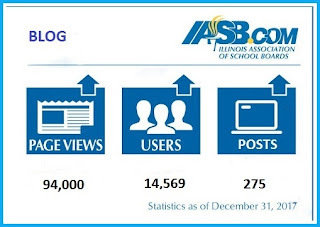 After more than three years using online platforms, the Illinois Association of School Boards (IASB) continues to expand its social media profile and to seek new communication opportunities with members and share major points of interest to public education leaders. “IASB has seen continual growth in its online presence since expanding into social media in 2014,” according to IASB Associate Executive Director of Communications Kara Kienzler. “With Twitter being advantageous for dispersing quick updates, and Facebook allowing the Association to expand upon stories and utilize live video, both networks satisfy objectives,” Kienzler said. IASB’s Twitter profile saw a jump in follower involvement last year, with engagements increasing by nearly 7,500. The IASB Facebook page increased engagements by more than 1,000. The Annual Conference, School Board Member’s Day, and legislative updates were among the most engaging social stories of 2017.
hashtag and got 1.2 million reaches. The 2017 Annual Conference hashtag, #ILjac17, saw more than 1,600 Twitter posts that registered 1.2 million unique reaches over the course of the three-day event. Posts for the annual School Board Member’s Day racked up more than 5,000 impressions, with even greater numbers for school districts that shared photos and videos honoring their own local board of education members. On Facebook, a “thank you school board members” video message reached 1,000 followers. Government relations posts, particularly involving the budget stalemate and school funding formula, propelled a rise in followers, with one shared column garnering more than 11,000 reaches on Facebook. Live video broadcasts reviewing the governor’s budget address and updates from the House and Senate chambers also proved popular. Spearheaded by the governmental relations department, the Association will add more weekly legislative updates through Facebook Live video broadcasts. The Blog hit new highs for page views, users, and posts in 2017. 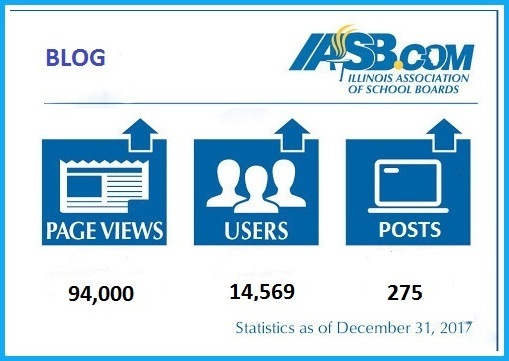 In addition to the two social platforms, the Illinois School Board News Blog has seen extensive growth since its launch in 2015. Offering more in-depth outreach, articles on public education and governance topics can be shared on social media. It offers an email subscriber feature and sharing links to allow users to be fully engaged. The online and social platforms have given IASB a reliable communication network to reach out to Association members and others interested in the intersection of public education and local governance. They have also created a quick and cost-effective method to provide real-time updates and announcements that can easily be shared. “What this amounts to is better communication between IASB members and their Association,” said Kienzler. For continual updates and Association news, follow IASB on Twitter @ILschoolboards, like Illinois Association of School Boards’ on Facebook, and subscribe to receive News Blog email updates.